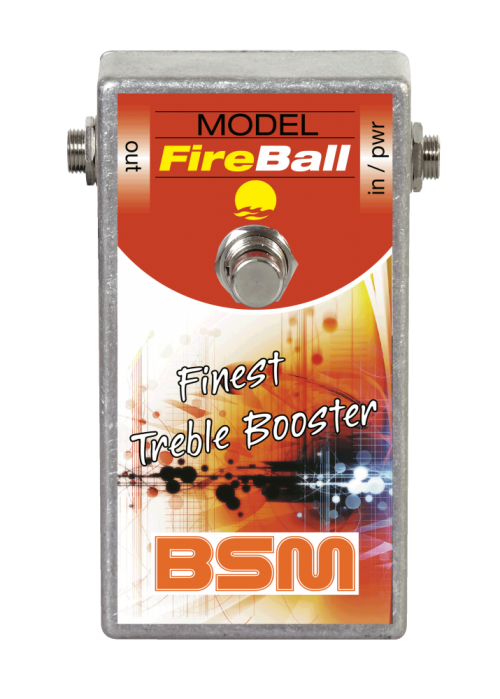 The BSM FireBall is custom-made to help you to recreate some special Ritchie Blackmore sounds. In response to user requests for Ritchie Blackmore's 1971 agressive stage and studio sound, BSM has created the FireBall, a pure custom-made booster with a very special transistor selection and optimized parameters, built as a limited production series. You can also use the FireBall to get the heavier Blackmore sound from his 1976 "Rising" recordings. The FireBall is not intended for bedroom-players. To keep the FireBall as pure of a recreation as possible, it is constructed without a volume control. BSM feels that this is the one and only way to guarantee that the high-gain germanium transistor of the FireBall can overload a tube amp's input stage without any coloration of the tone. The HS/Fireball is based on the British HORNBY SKEWES unit first issue, produced early 1967, as used by Ritchie Blackmore, the brilliant and impulsive guitarist of Deep Purple. The unit produces a powerful and biting sound that was used to help create the epochal masterpieces e.g. "Deep Purple In Rock" and "Fireball". The long yearned for new edition, now issued under the name HS from BSM, includes the same germanium transistors as the the original 1967 version. The Fireball unit is a specifically high-grade selected HS unit. Put it in front of a Marshall Major and you will achieve Blackmore's boosted sound on the Deep Purple album "Fireball" or Rainbow's "Rising". Almost all British rock guitarists using single coil pickup guitars used a germanium Treble Booster from the late 60's to the mid 70's. By the end of the seventies, the Treble Booster was replaced by a new circuit from Japan, the so called Tube Screamer and other similar overdrive circuits. These were based on the old Treble Boosters and therefore had a very similar frequency response. The germanium boosters on the other hand, sadly fell into oblivion despite their unique and inimitable sound. The HS / Fireball Treble Booster has been specifically designed for single coil pickups with a relatively low coil inductance, such as pickups in Fender, Rickenbacker, Burns or Vox guitars. On these pickups, the Fireball produces (with the volume control of the guitar turned up to the max) a fat, biting and penetrating lead sound, minus any shrill characteristics. By lowering the guitar's volume control, many shades of crunch can be easily dialed in. Another thing to consider is that when a guitar amp's volume is turned up (reaching saturation), the power amp normally begins to mute the highs, which results in a duller sound. At an amp's full tilt, the Fireball Treble Booster allows a more transparent tone (covering the entire frequency range) to shine through. The presence control on the amp need only be minimally used (if at all). When vintage amps are used (such as the Fender Deluxe, Fender Bassman, Vox AC30, Marshall 100w or Marshall Major 200w) it is amazing what effect the use of a good treble booster has. It is also of interest to note that Ritchie Blackmore used modded Marshall Major 200 heads and played on "Made In Japan" with the following settings: Presence 0; Bass 4; Middle 5; Treble 6-7; Volume 7-8. The Treble Booster is inserted between guitar and amplifier, not into the FX loop. The magical tone is achieved by the interaction between guitar pickup, treble booster and amplifier. The unit is powered by a 9V battery with a current consumption of approx. 270 uA. The average output level is 10dBm, the maximum output voltage when the strings are struck really hard is 7V max. Note: The positive pole of the battery is ground. If you have any questions concerning our products, especially the BSM FireBall Treble Booster, our tech-head and mastermind Mr. Bernd C. Meiser would be happy to talk to you. So don't hestitate any longer and send him an email to info@treblebooster.net or use the contact form to contact him.